Las Vegas, NV – September 21, 2017 – Winshuttle is excited to announce that Co-Founder and Chairman of the board Vikram Chalana will release the 2nd edition of his new book “Application Data Management – Empower Business Teams to Get Data Right” to the SAP community at SAP® TechEd®. SAP TechEd is SAP’s annual technology conference held in Las Vegas September 25-29th. Businesses across industries are already starting to treat data as a strategic asset. But before enterprises can leverage technology trends like digital transformation and real-time analytics, they need to maintain high-quality data in the most important system of record – the ERP system. 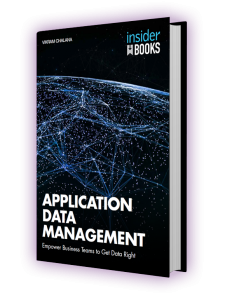 This book introduces Application Data Management (ADM) as a framework to empower business teams to maintain and govern high-quality data in SAP ERP, and stay competitive in the digital economy. With guest authors from ASUG, Configurable Management, Clear Process Solutions, and DATUM, preface by Gartner Analyst Andrew White and over a dozen real-world use cases from notable brands, this book provides the guidelines organizations need to use application data management to accelerate their digital transformation journey. The 2nd edition of this book was released to Winshuttle users at the Winshuttle User Group (WUG) conference in Atlanta earlier this week and will be available to the extended SAP community online through Insiderbooks, and at SAP TechEd. Conference goers can stop by the Winshuttle booth #203 to pick up a book while supplies last.